This month we have three of our esteemed judges on vacation this week, as is Mindy, therefore we are going to postpone the voting of the July Challenge until August 8th. So we thank you for your great “Peace Theme” entries and will have your results around the 10th of August. In the meantime, let’s kick off our August Dash of Inspiration Design Challenge to infuse a sparse category with some fresh new designs! The message of the category/recipients must be clear in the card front text and/or inner verse. Must be approved for the Holidays > Halloween Cards > 1st / First Halloween > In your New Home category. Recipient must be ‘general’, in other words; any relation-specific creations should be done after the challenge – not for the challenge. Imagery must include a home, house, or castle (haunted house okay too) – big or small somewhere in the image. As well as featured on the GCU Public Facebook Page – nearly 35,000 followers, now THAT’S exposure! 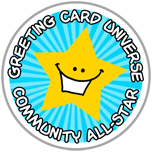 The winning card will be added to the Greeting Card Universe Design Challenge Winners Pinterest Board – currently GCU’s Pinterest Page followers: 1.9K! Glad to have you join us, Julia. Entry received, good luck! Hi Ron. We’ve got you hooked now, I see! Entry received, good luck! Hello, Michelle. Pleased to see you were inspired to join us this month! Your entry has been received, good luck! HI Doreen, Here’s my entry for the Aug Challenge. Glad you popped in to join in the fun this month! Entry received, good luck! The link above is to my entry for the August Design Challenge. Hi Gail. Glad you decided to participate this month. Entry received, good luck! Hello, Judith. Entry received and good luck to you! Thanks for joining in the fun! I would like to enter this design into the contest. Wonderful designs entered so far! Good morning Betsy. I love seeing everyone’s creativity! Entry received, good luck! Hi Laurie! Fun to see your raccoons in another challenge. 🙂 Entry received, good luck! Welcome, Susan! Isn’t this the first time you’ve entered a challenge? So fun to see new faces 🙂 Your entry has been received, good luck. Thank you, Doreen. Yes, I think this must be my first time for entering a Challenge. I’m hoping to get going with my card designing again – this seemed a good way to start. Great designs so far – good luck everyone! Hello Teri. Nice to have see you joining us! Your entry has been received, good luck. Hi Christi. Your very proper looking ghosts appear ready for prime time! Your entry has been received, good luck.